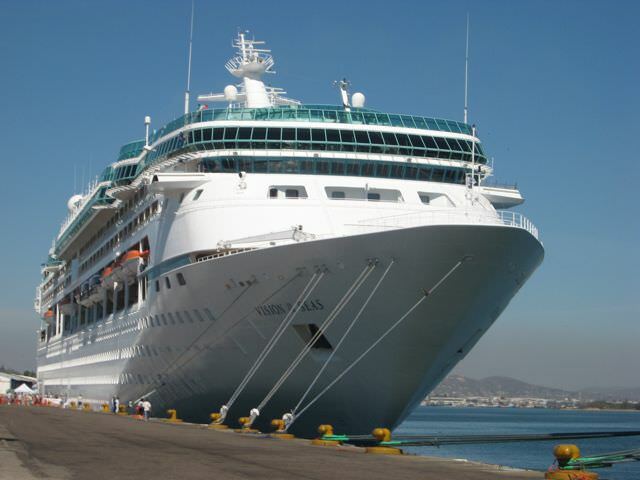 The 78,491-ton, 2,000-guest Vision of the Seas was the last of Royal Caribbean’s six Vision-class ships, launched in 1998, just a year before Royal launched the game-changing Voyager of the Seas. Vision is not much less than half Voyager’s size, and today is even more overshadowed by Royal’s Oasis and Allure of the Seas, which are nearly three times as large. Size isn’t everything, of course, and midsize ships have a certain charm owing to their greater coziness and the convenience of having everything close by. Still, Vision and her Vision-class ships do feel a bit dated. Most public rooms are located on Decks 5 and 6, radiating out from a central seven-story atrium full of faux palm trees and glass elevators. 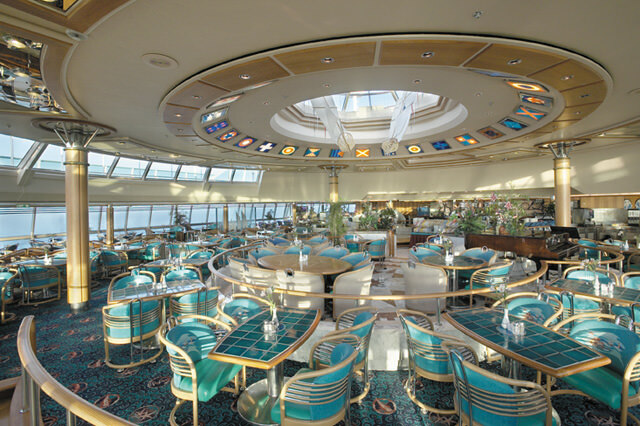 At the base of the atrium, on Deck 4, the Champagne Bar offers musical entertainment to go with its namesake bubbly. On Deck 5, there’s the Masquerade Theatre and the flashy and crowded Casino Royale. On Deck 6, there’s the nautically themed Schooner Bar for piano entertainment and relaxation; the cozy Showboat seaview lounge; the Some Enchanted Evening lounge for a mix of live music, dancing, and entertainment; and six shops. 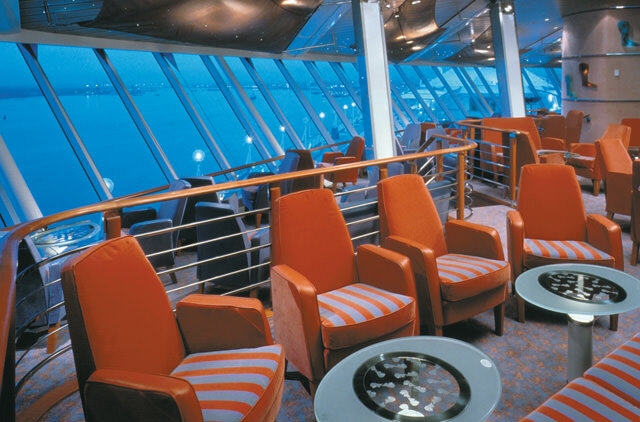 Up at the top of the ship, Deck 11’s Viking Crown Lounge is an observation lounge by day and disco by night. For kids, the Adventure Ocean playroom on Deck 10 is stocked with toys and games, and there’s a teen center and video arcade right next door. On Deck 9, you can swim or lounge in the spacious main pool area or chill out in the Solarium, with its retractable glass ceiling and vaguely ancient design motifs. Just astern, the spa and fitness center offers the usual selection of treatments, steam rooms, and saunas, plus small aerobics and workout rooms. One deck up is a rock-climbing wall and a jogging track. Dining options on Vision are limited. Dinners are taken at the two-deck Aquarius Dining Room, with its grand staircase and dramatic chandelier. Other than that, your main alternative is the forward-facing Windjammer Cafe buffet restaurant. Staterooms aboard the Vision-class ships tend to be small and have seen a lot of use in their decade and a half of service. Standard outside staterooms are only 152 square feet, and come with a TV, a small sitting area, a vanity, and a small bathroom. If you want a private balcony, you’ll have to bump up to a 191-square-foot Superior Oceanview stateroom, which also offers a minibar, small sitting area, and lots of storage space. The top-of-the-line accommodations are the 1,177-square-foot Royal Suites, which come with separate living room and bedroom, a huge marble bathroom with a whirlpool tub, a baby grand piano, and a 138-square-foot private veranda. Just retuned from a 10 day cruise to the eastern Carribean on the Vision of the Seas. The service by all staff was phenomenal. The ship was very well maintained. Embarkation and disembarkation was good. The only disappointment was the food. 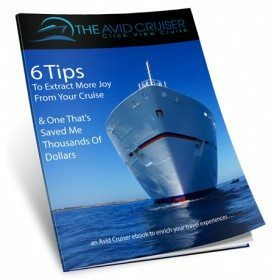 It was average at best and did not offer the many choices we were used to on other cruises. For example, room service was available 24/7, but only for a fee after 1AM. 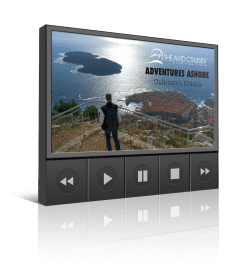 This would not be so bad on other cruises as we have had access to food 24/7. On this cruise, the buffets and cafes all closed by 1AM. If you stay up late, going to shows or the lounges, then there is no option after 1AM other than room service for fee. Additionally, the rolls, pastries, and other baked goods tasted as if they came from Sams Club or Costco. They offered the exact same baked goods every day for 10 days. The breakfast buffet offered the exact same thing every morning for 10 days. The dinner offered better choices, but the quality was good or average. I swear I had a chicken marsala dinner that tasted like a Marie Callendar frozen dinner on the last night. There were several times that the Windjammer buffet was completely closed. You had to wait for it to open. The other cruises that we have been on had access to buffets all day. The excursions at the various islands were well organized. The ship was a bit smaller than other ships that we have been on. In some cases, that was kind of nice in that it was easy to get around. Robaq- what other cruise lines have you been on. My experience is with Regent – how would they stack up? You are comparing a Chevy to a Rolls. Two entirely different cruise lines.